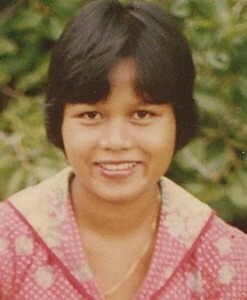 In 1974 I returned home after five years from the war Laos and a slow boat through South East Asia and brought with me a lovely wife who was born in Indonesia of Thai mum and French dad. My parents loved her and we had many pleasant months together but of course sometimes I was involved talking to my parents and Geraldine was left out of it, because just starting to learn English. Once she was watching TV on her own and asked what was going on in the program. I came over and saw it was documentary about classic artists’ depictions of halos in ancient paintings. She told me, “I can see them.” She went on that as a child she was fascinated by the halos around some people’s heads and got dismissive discouragement from others when she mentioned it. Clearly she was not making up what she told me but I didnt follow it up.